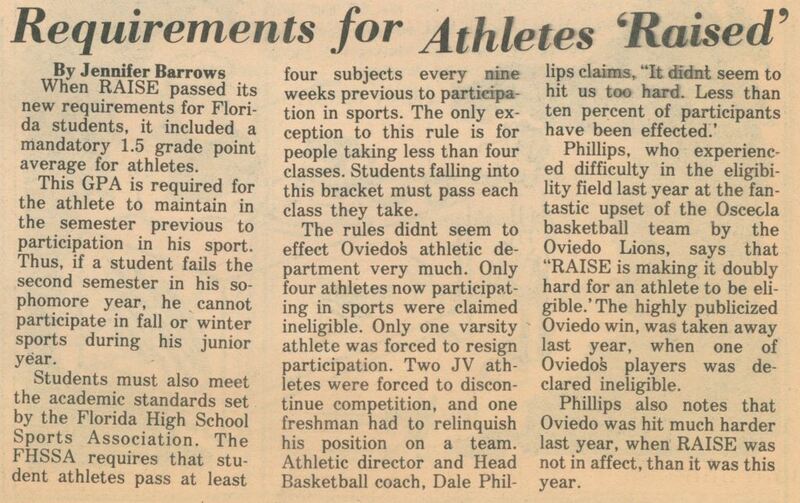 A newspaper article published by The Lion's Tale, Oviedo High School's student newspaper, in February of 1984. This article reports on the new RAISE initiative, which established new requirements for Florida student athletes and how these requirements, as well as the academic standards set by the Florida High School Sports Association, have affected the OHS athletics program. Oviedo High School is a Seminole County Public School located in Oviedo, Florida. Originally called the Oviedo School, the institution was first established in 1932 as a K-12 school. In 1948, the secondary grades separated from the elementary school. The upper grade levels formed Oviedo High School and moved to the campus at 601 King Street. Oviedo High School is notable for The Lion's Tale, the award-winning school newspaper recognized by various national and state scholastic press associations; its high ratings from the Governor's A+ Plan for Education; and its successful athletics programs. 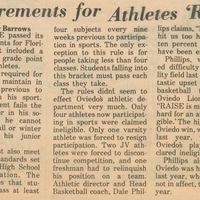 Original newspaper article: "Requirements for Athletes 'Raised'." The Lion's Tale, Vol. XIII, No. 5, February 1984: Private Collection of Dan Beistel. Digital reproduction of original newspaper article: "Requirements for Athletes 'Raised'." The Lion's Tale, Vol. XIII, No. 5, February 1984. Originally published by The Lion's Tale. Copyright to this resource is held by The Lion's Tale and is provided here by RICHES of Central Florida for educational purposes only. "La Sertoma International." La Sertoma International. http://www.lasertoma.org/. "Oviedo High School." Oviedo High School, Seminole County Public Schools. http://www.oviedo.scps.k12.fl.us/. "About Oviedo High School." Oviedo High School Reunions. http://www.ohsr.net/about-oviedo-high-school. “Requirements for Athletes 'Raised'.” RICHES of Central Florida accessed April 26, 2019, https://richesmi.cah.ucf.edu/omeka/items/show/5271.